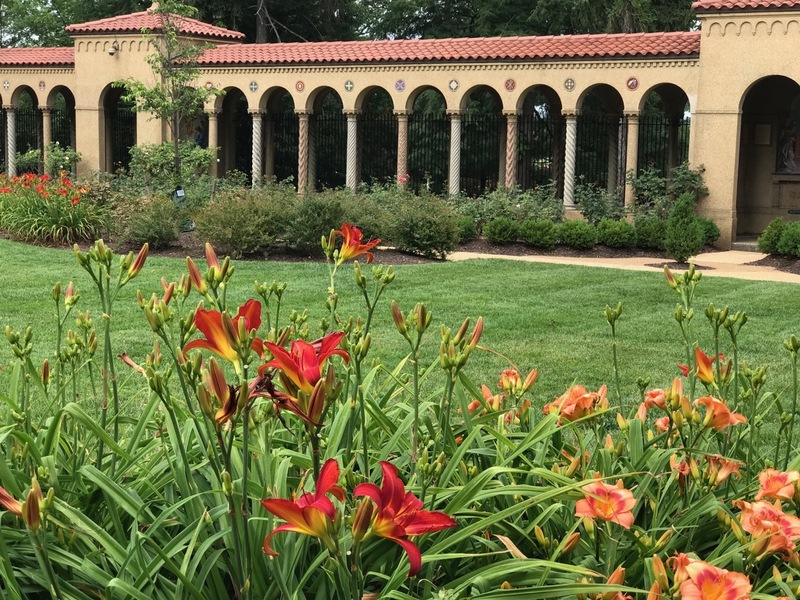 The Franciscan Monastery of the Holy Land in Washington, DC was an interesting destination on this year’s Garden Bloggers Fling. The Neo-Byzantine style church was built between 1898-1899. 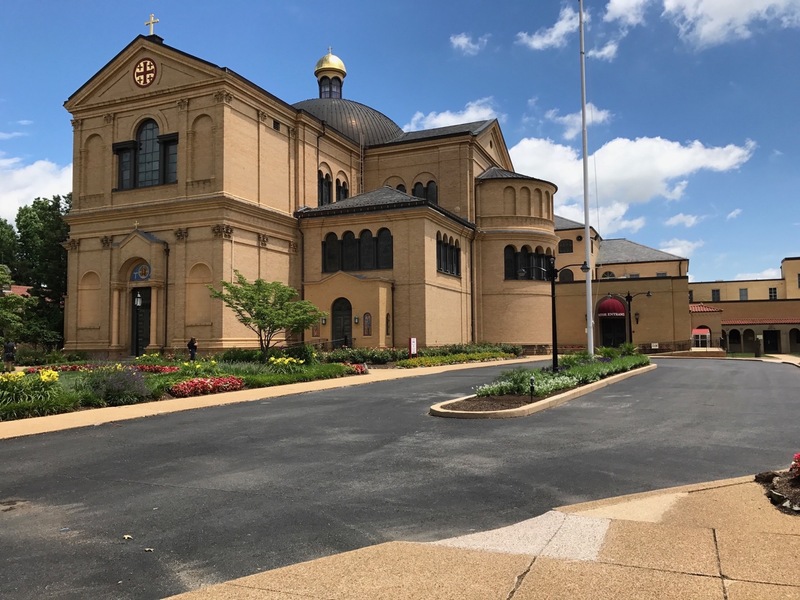 At right of the church sits the Rosary Portico. Our group arrived just after lunch. 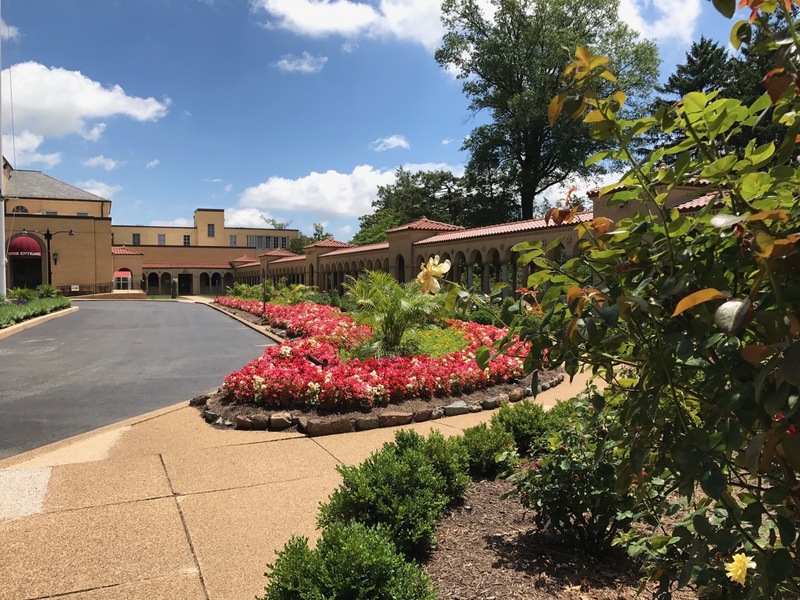 I had been curious to see this site, described as an oasis of peace, with over 1000 roses, and enhanced by many perennials and annuals. 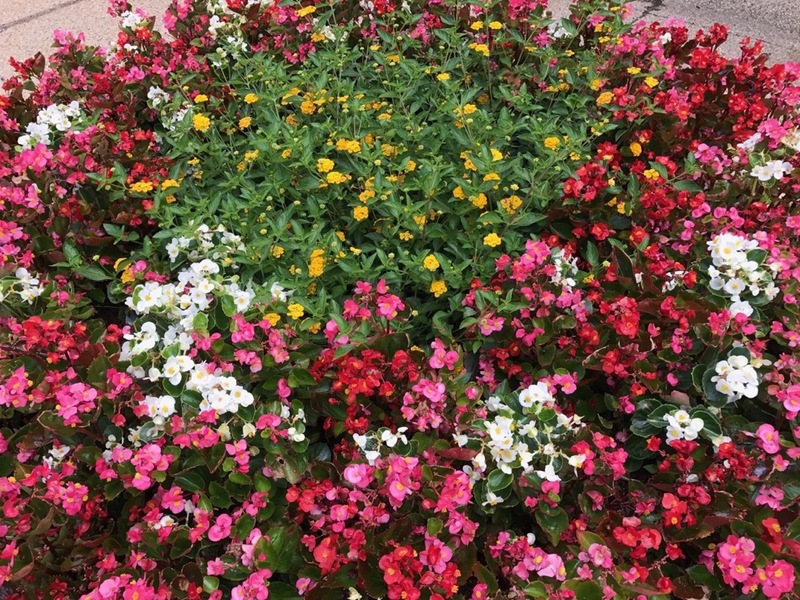 On this hot summer day the strongest color came from annuals such as begonias and lantana. 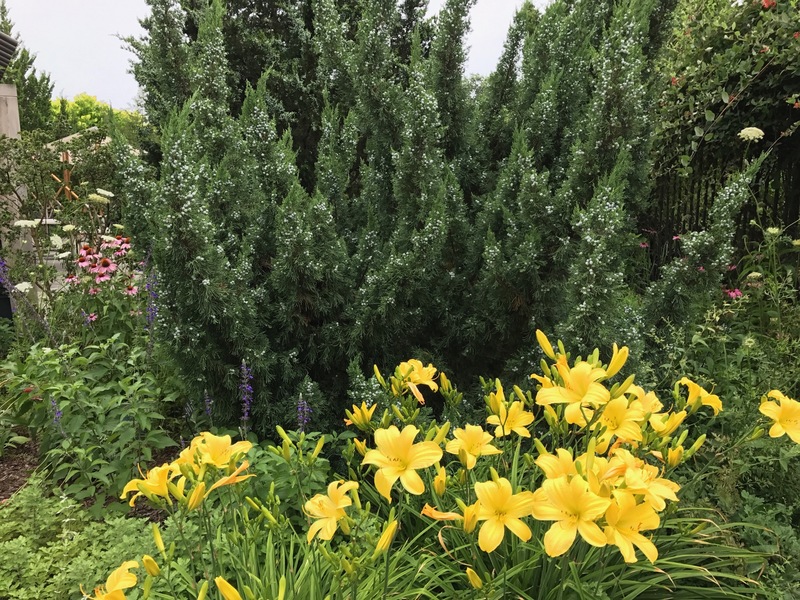 As in many gardens on this year’s Fling, daylilies played an important role as well. 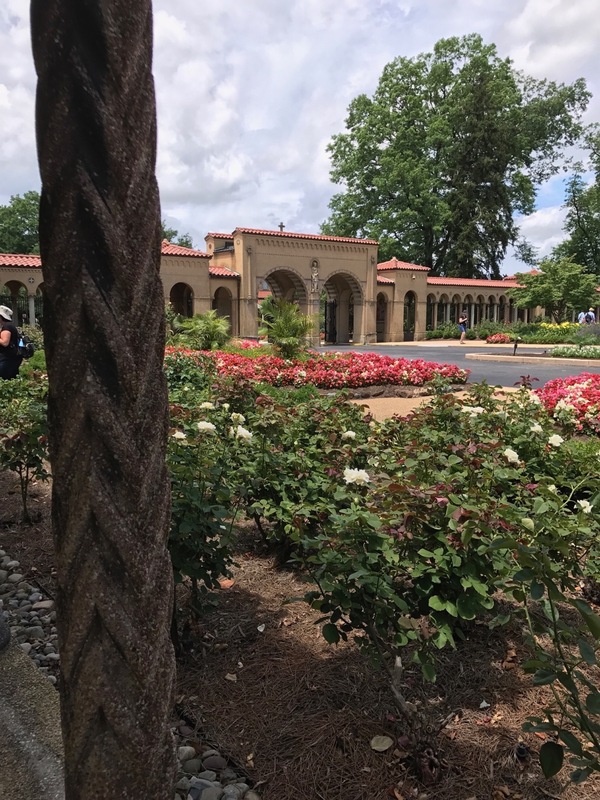 I enjoyed the way the coloring in this grouping reflected the exterior of the Rosary Portico, echoing the terra-cotta roof tiles. 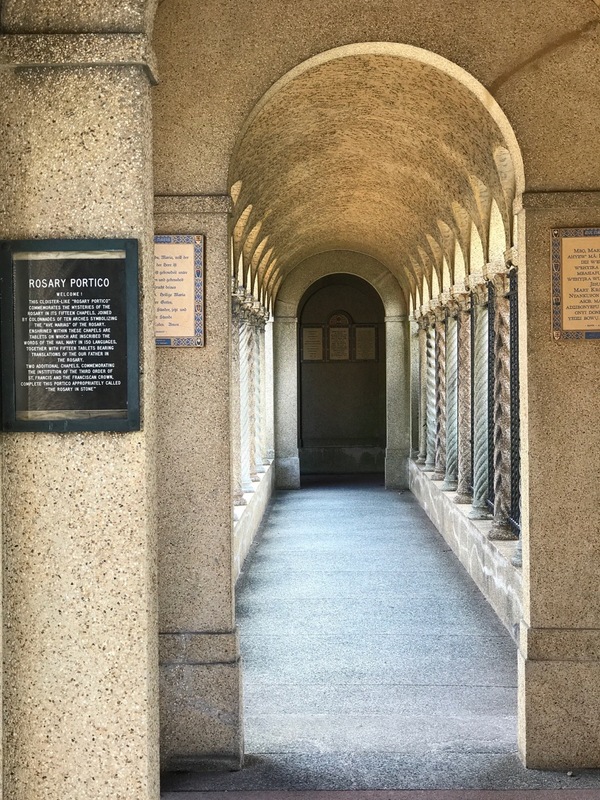 I quickly wound my way out of the sun, passing along the Rosary Portico. Pausing to explore the architecture of the columns, I felt the temperatures moderate under the vaulted ceiling. Eventually an open gate revealed an expansive panorama. Steep stairs led to gardens below. 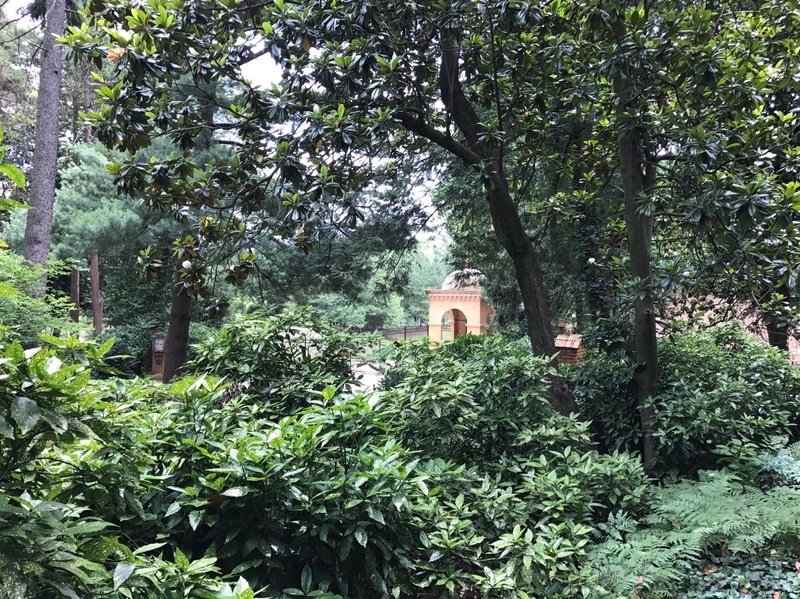 Graceful magnolias towered over the shady lower gardens. I read up on this monastery after returning home. 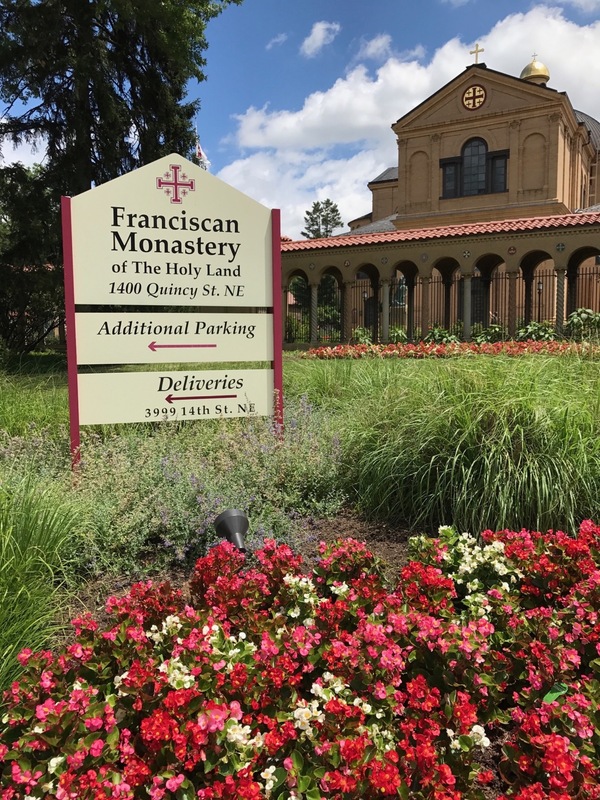 Franciscans have been tasked with caring for holy Christian sites for 800 years. Envisioned as a holy land for America, a number of shrines are represented here with accurately-scaled replicas. 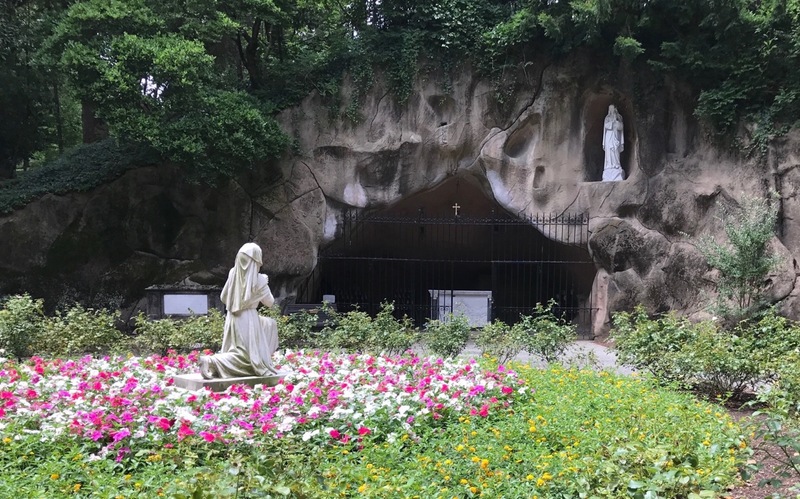 Though intended to be welcoming and inclusive to all, the very nature and purpose of this place, the reason for existence is a religious one, and I felt a bit of an interloper into this spiritual setting. In looking through the photographs I took that day, I have been surprised by my reaction but I want to be honest. 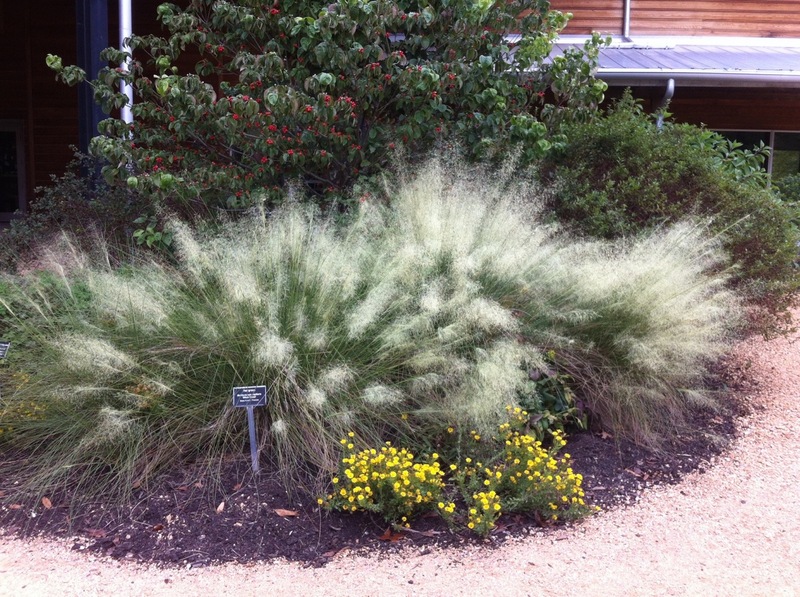 In considering the plants and garden design I never sensed a real “Oh, wow!” moment during my visit. 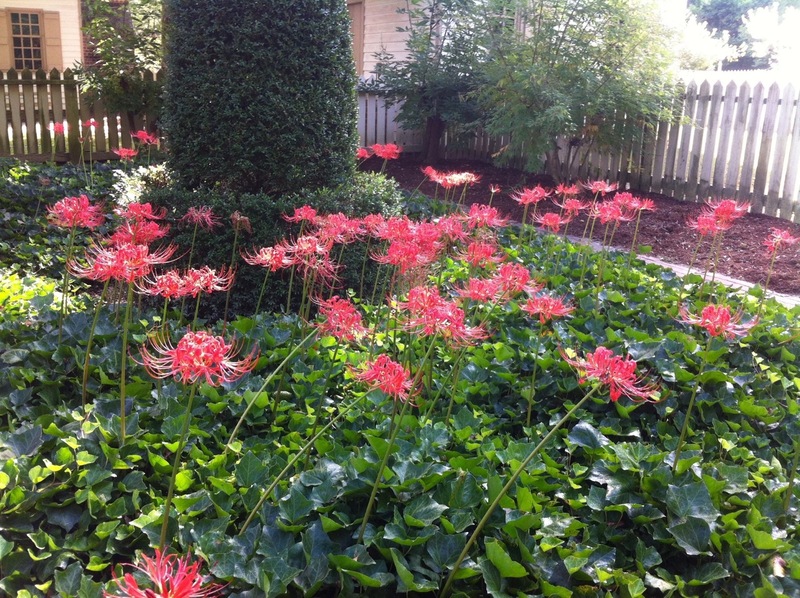 Without intending disrespect, I confess, aesthetically, the garden and statuary were simply not to my taste. The tombs were rather eerie and the manmade stone I found particularly off-putting. 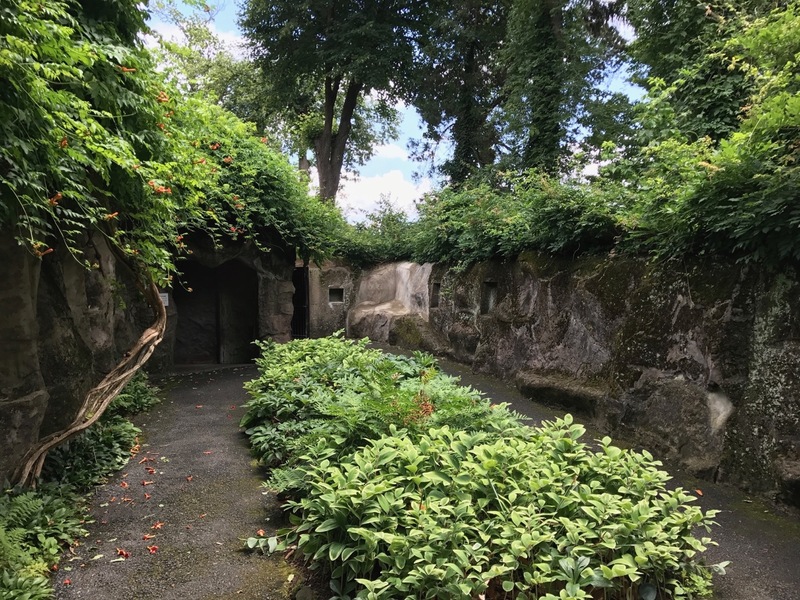 I am glad to have had the chance to explore this place, and am looking forward to seeing what aspects other Fling visitors responded to in this setting. 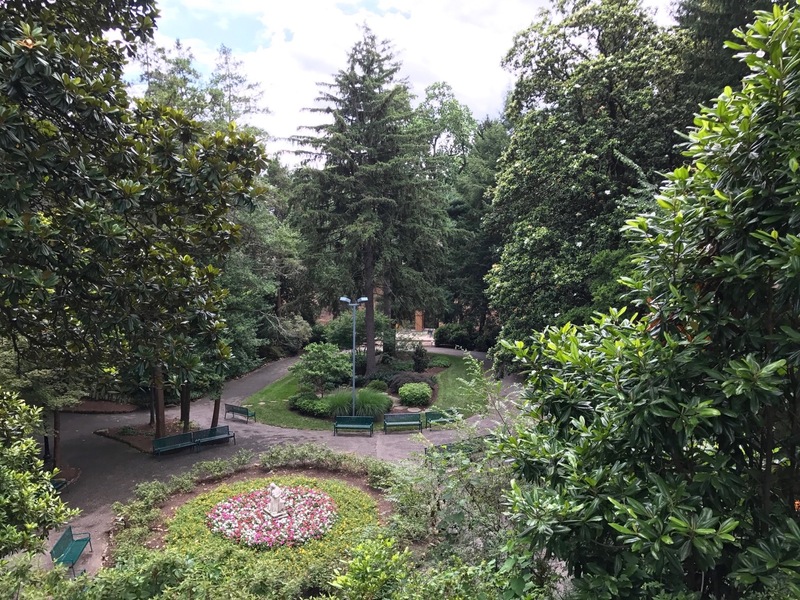 Normally drawn to quiet, meditative spaces, I had eagerly anticipated seeing the monastery’s contemplative grounds; however, in the end I never felt a strong connection with this garden. 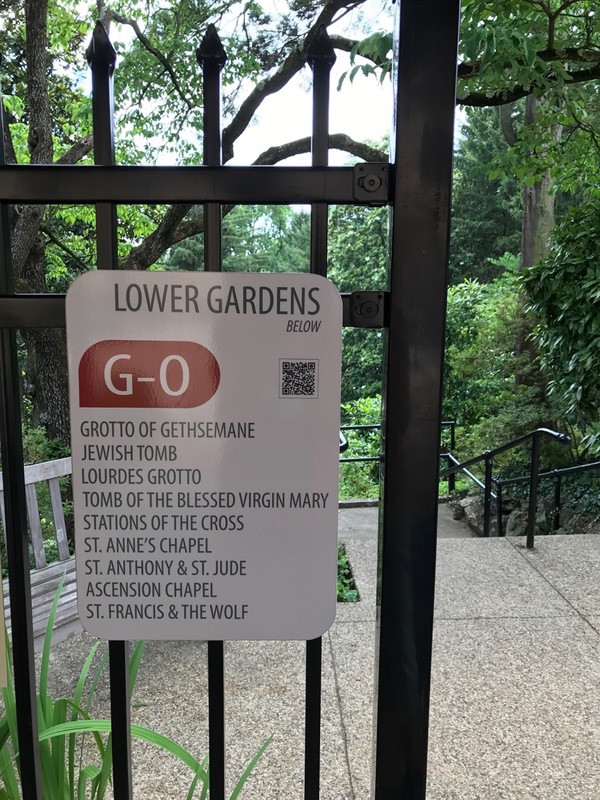 This entry was posted in garden and tagged #gbFling2017, Garden Bloggers Fling 2017, monastery, public gardens on July 12, 2017 by pbmgarden. 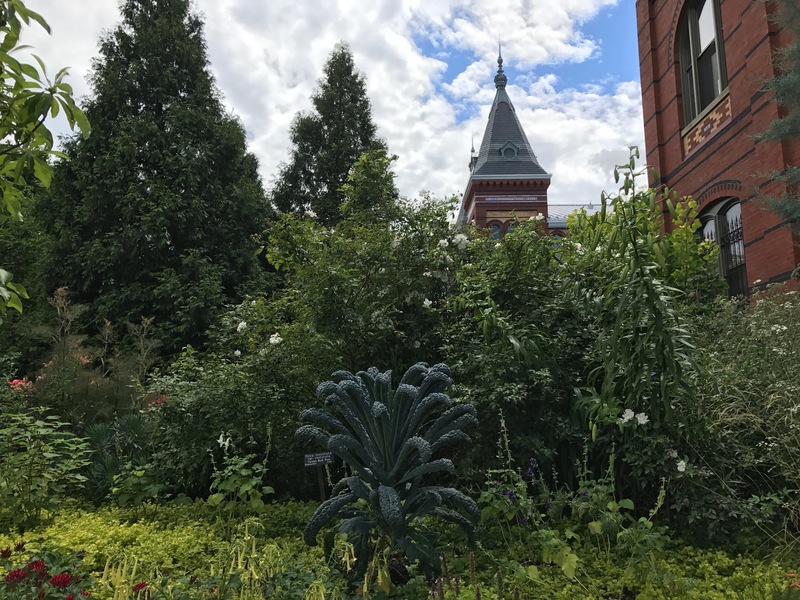 On Friday afternoon of the 2017 Garden Bloggers Fling, we descended upon the National Mall in Washington, D.C. to visit the Smithsonian Gardens. The day was hot and sticky, typical weather for this time of year. 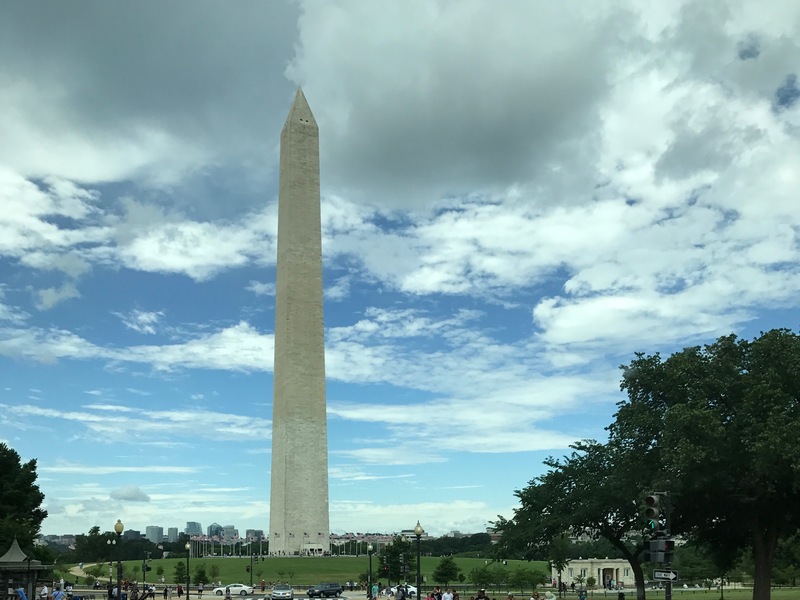 The Washington Monument was visible on our left as the bus turned right, dropping us off in front of the Smithsonian Institution Castle. 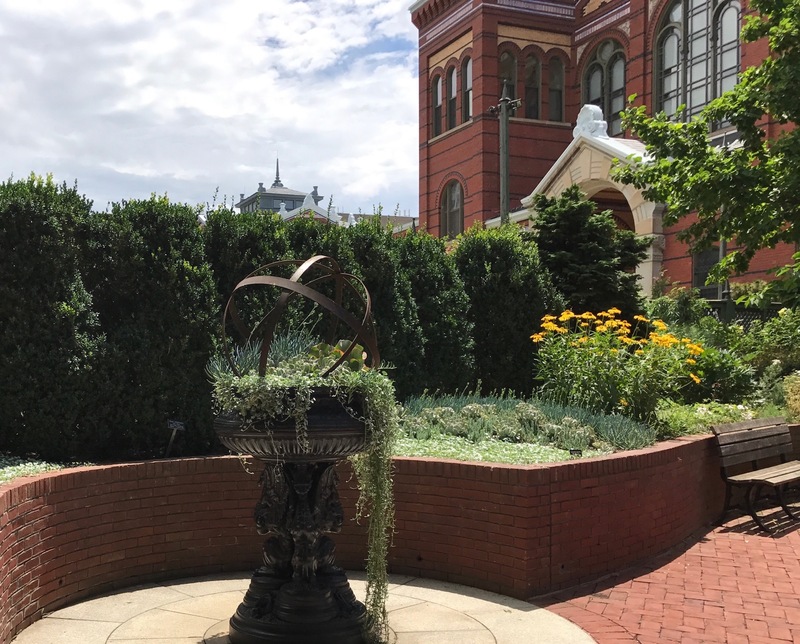 With three hours to explore, many of us began by entering the castle and passing through to the back to view the Enid A. Haupt garden. 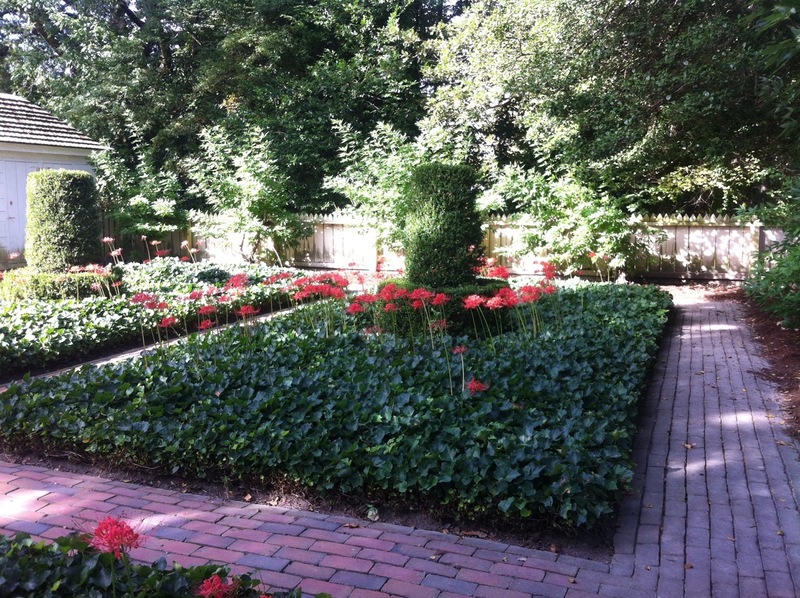 My photos failed to capture the geometry and scale of the garden. 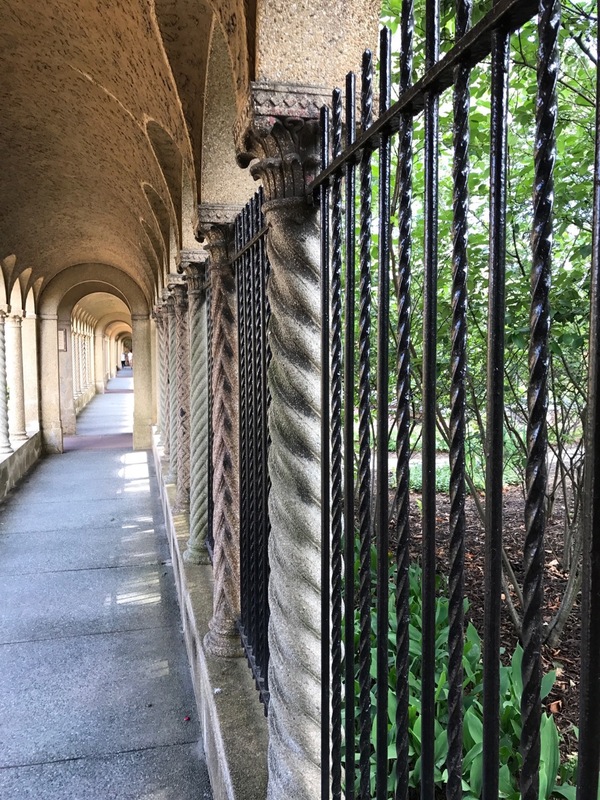 The black iron edging seemed to grab all my attention. 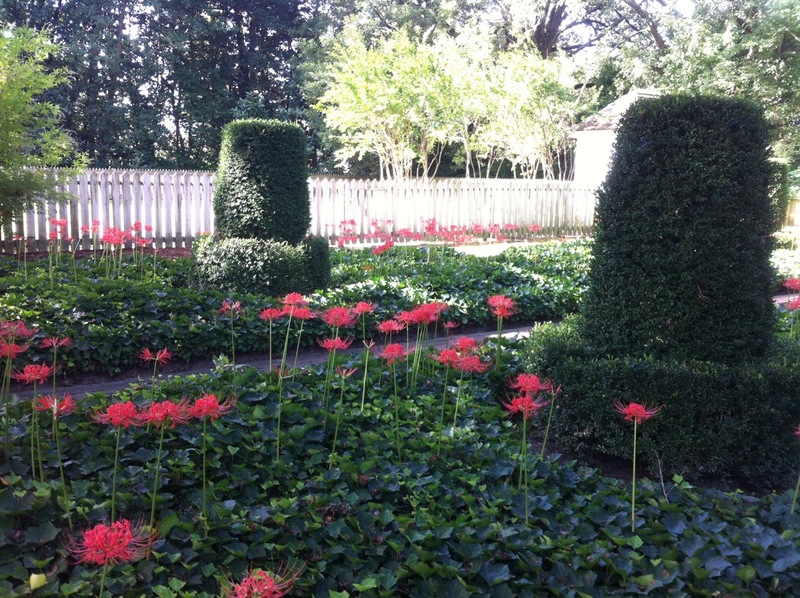 The Mary Livingston Ripley Garden was oft-mentioned as one to be sure to see. 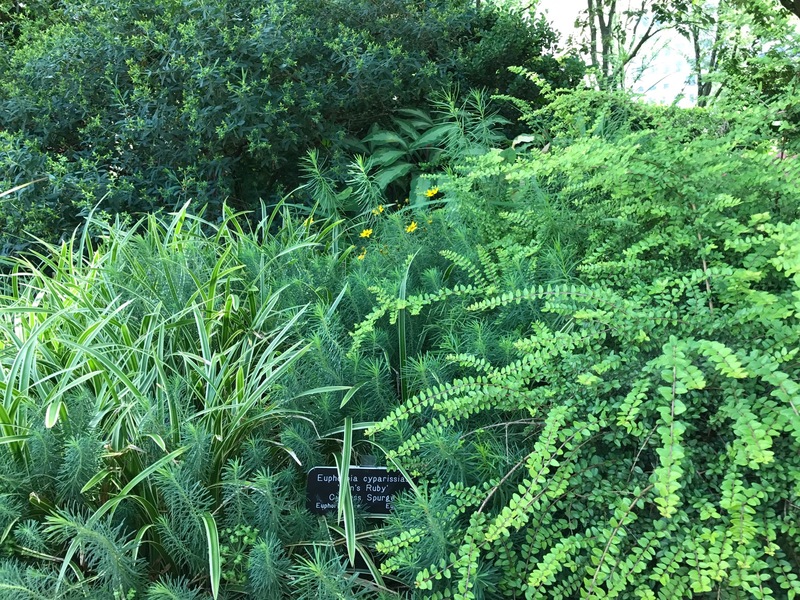 Indeed the lush plantings were a delight. 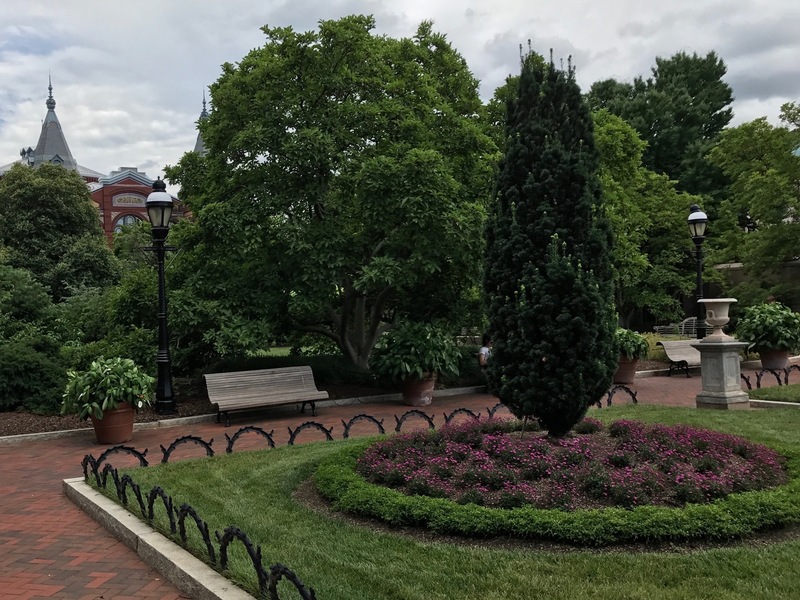 On the left below is a Franklin tree, named after Benjamin Franklin. 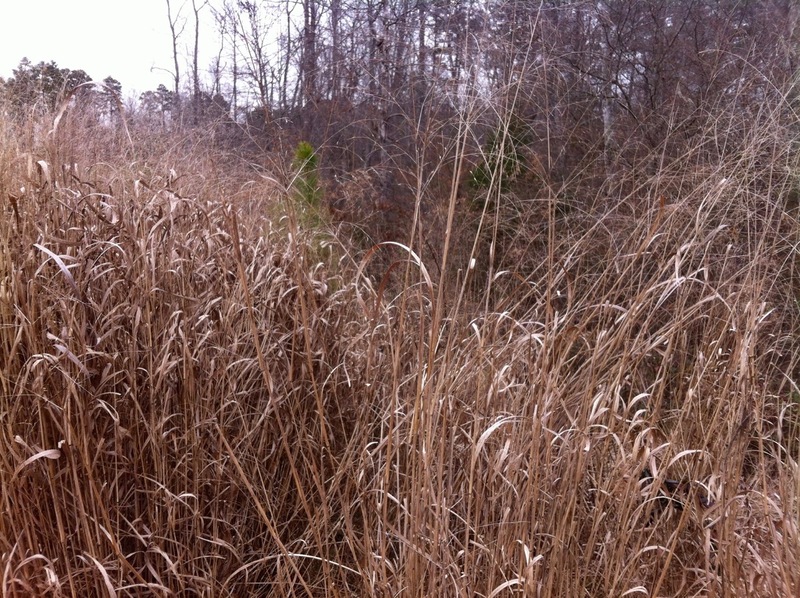 It has not been observed in the wild since early 1800s. 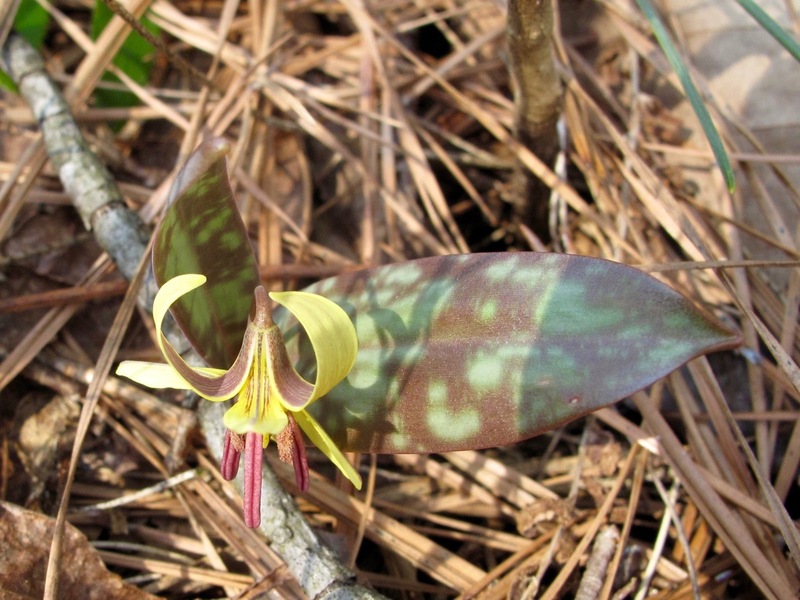 It exists today due to propagation of seeds collected between 1773-1776 by William Bartram from the tree’s native location, a mere couple of acres along the Altamaha River valley in Georgia (southeast United States). 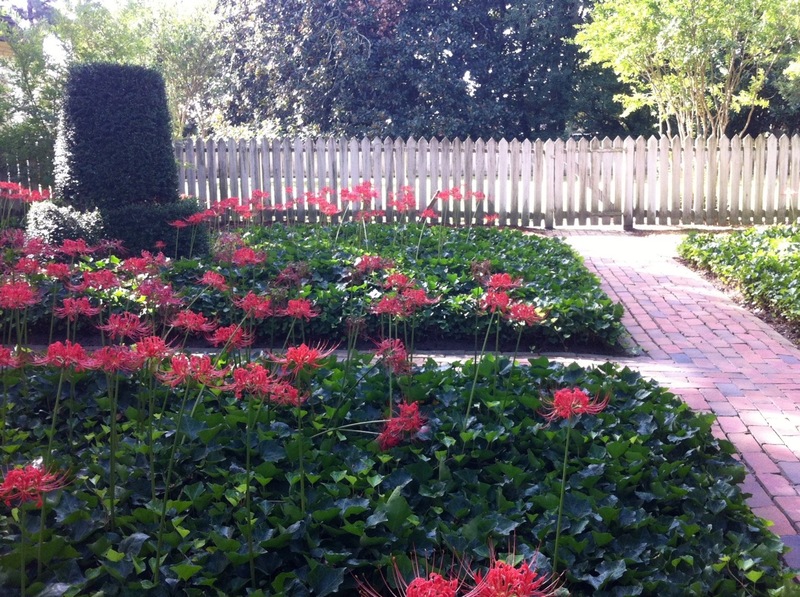 When in bloom it is said to have white camellia-like flowers. 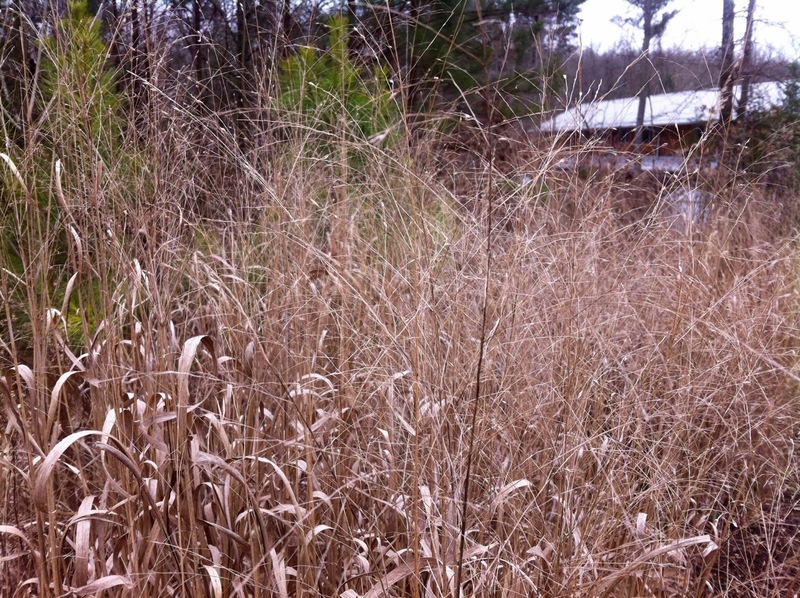 These contrasting textures were appealing. 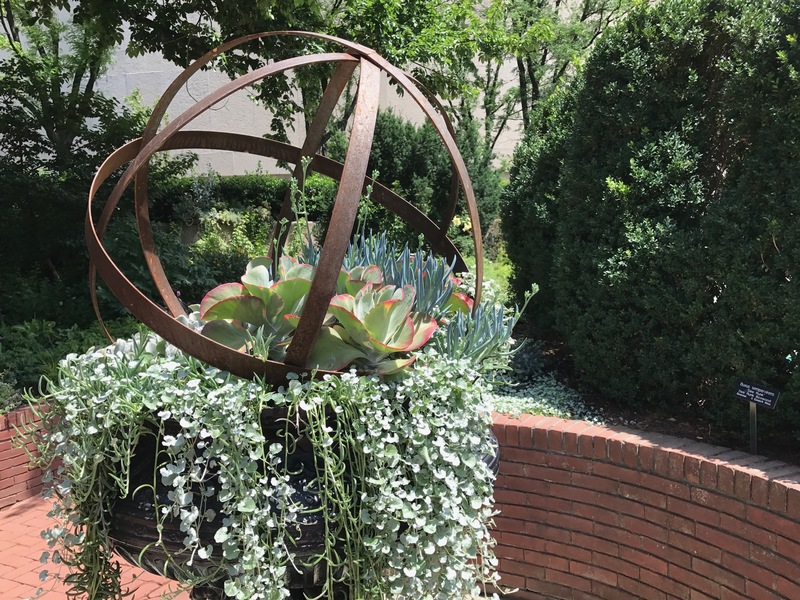 This planter was sedately sophisticated. In the background yellow echinacea added a lively accent. 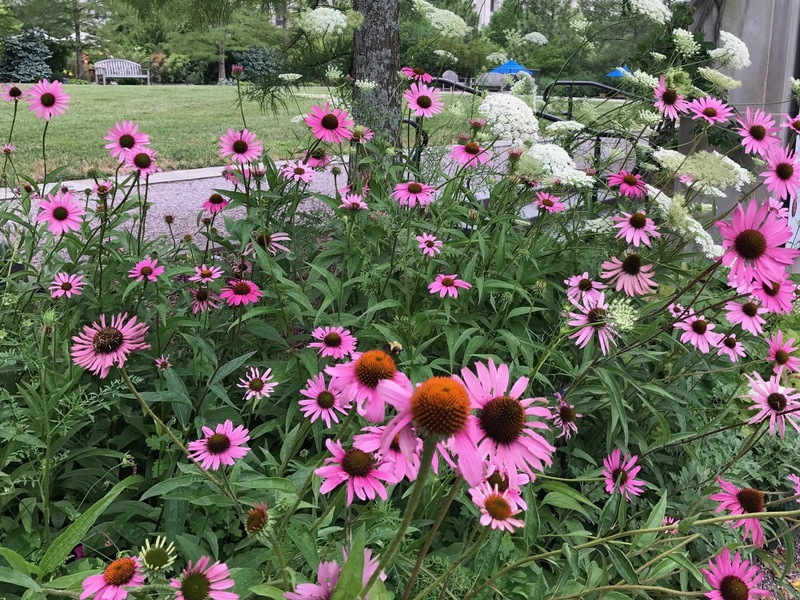 Echinacea was incorporated into many of the Fling gardens. 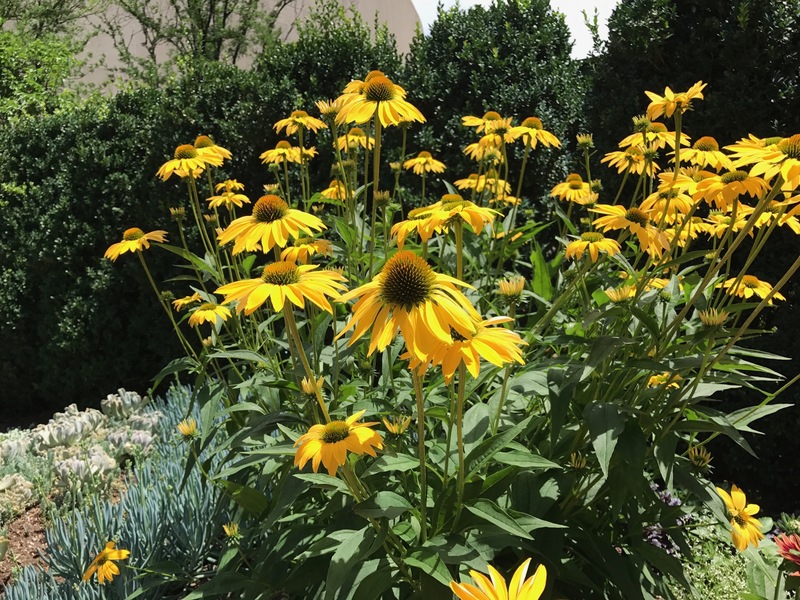 The Ripley’s sunny Echinacea ‘Leilani’ is one I had not seen before. 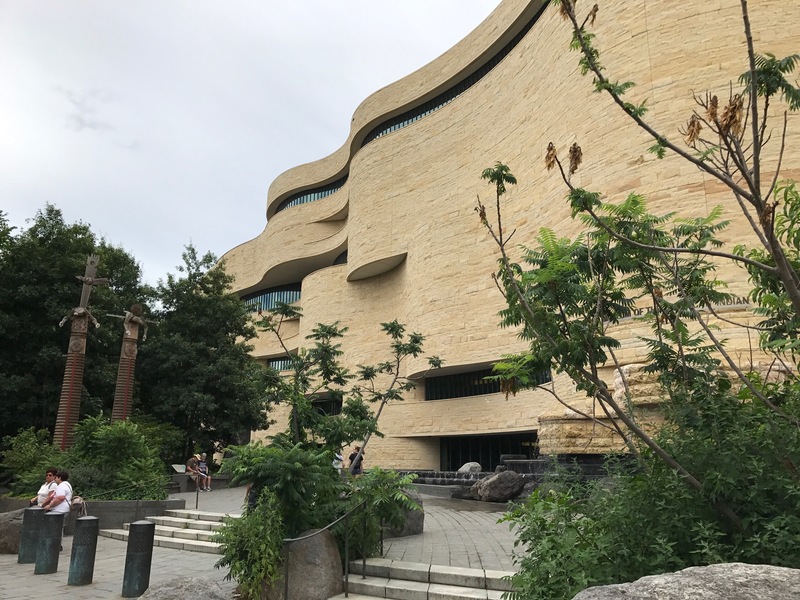 The round edges of the Hirshhorn Museum are visible in the background, reminding me I would have enjoyed spending three days on the Mall revisiting museums. 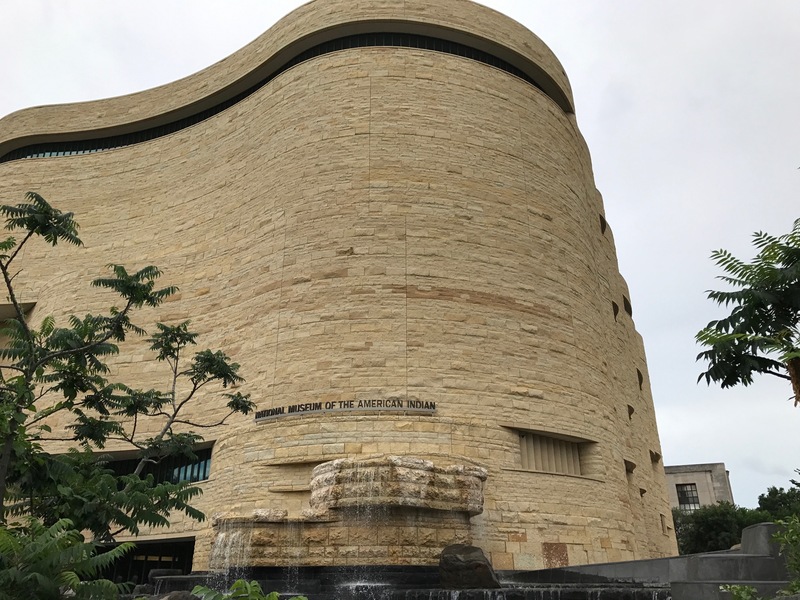 It had been many years since I was last in D.C.
As I headed back to meet up with the Flingers I passed one of several buildings added to the mall since my previous visit, National Museum of the American Indian. The architecture was so interesting, it would have been great to see inside but time was running short. 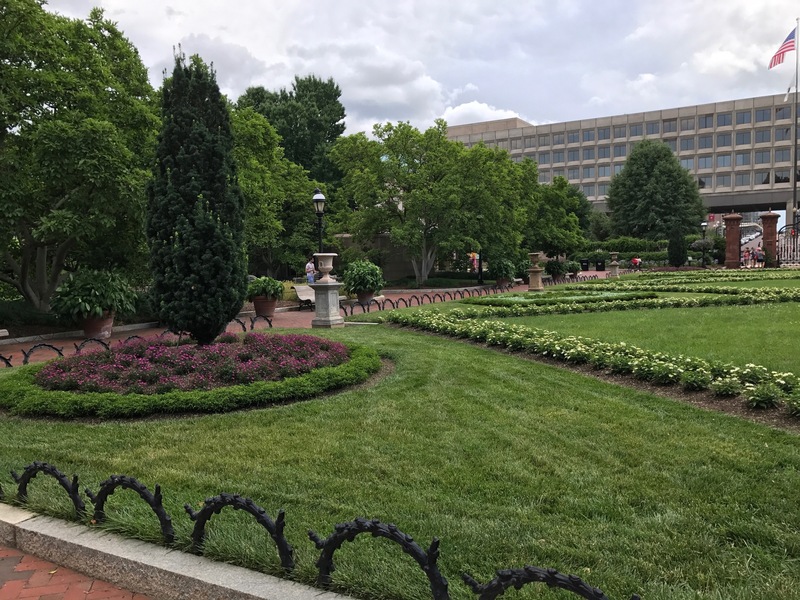 The U.S. Botanic Garden was the final stop before catching the bus back to the hotel. 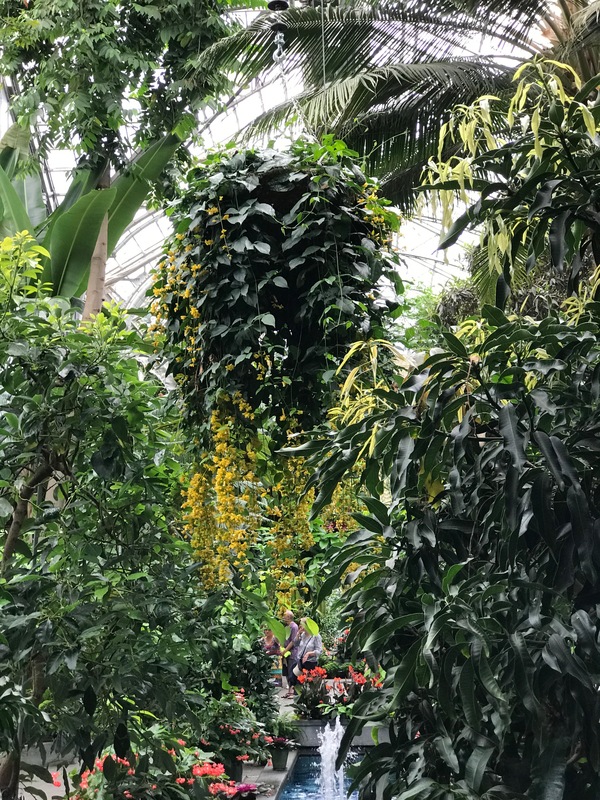 I had time only for a quick peek into the conservatory and a dash through the outer gardens. By this time the clouds had burst into a brief shower. The evening brought cooler, drier weather that lasted for the rest of the Fling. 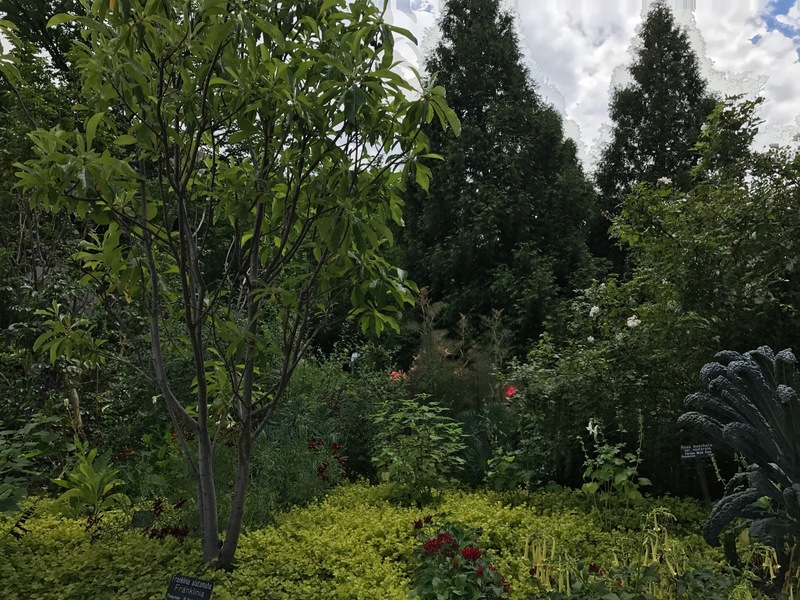 This entry was posted in garden and tagged #gbFling2017, public gardens, Smithsonian Gardens on July 6, 2017 by pbmgarden. 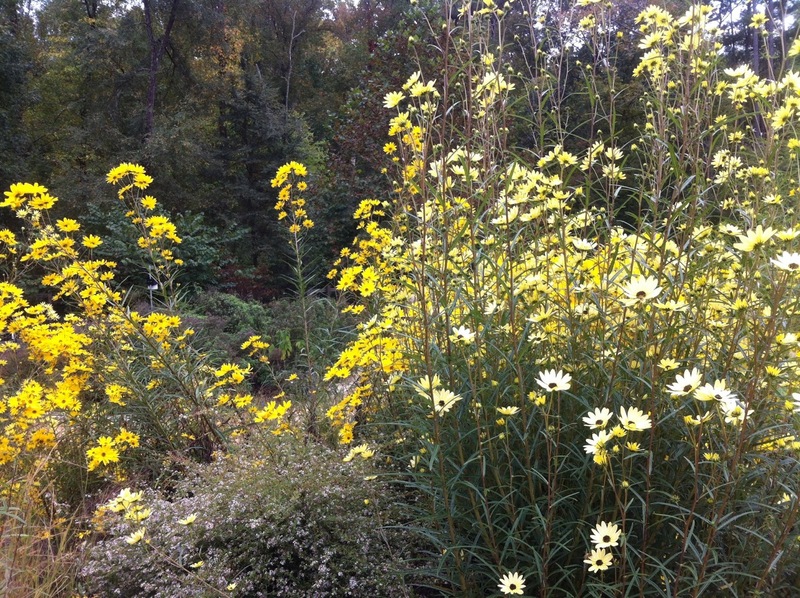 Monday at the North Carolina Botanical Garden (NCBG) my husband and I enjoyed one of our favorite plantings, a wildflower display of Packera aurea (Golden Ragwort) and Phlox divaricata (Eastern Blue Phlox). Both are eastern North American natives. He is partial to the Golden Ragwort while I prefer the phlox. 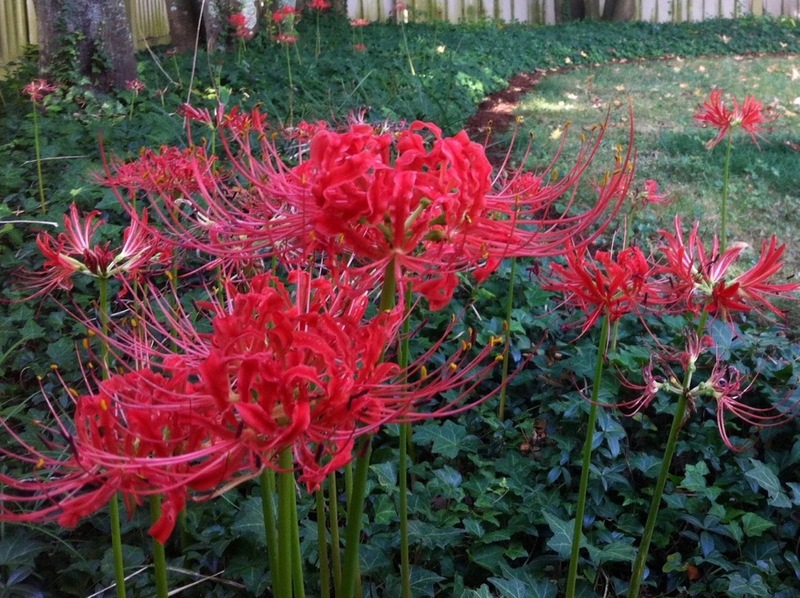 Together they make a great display, much more vivid in person. 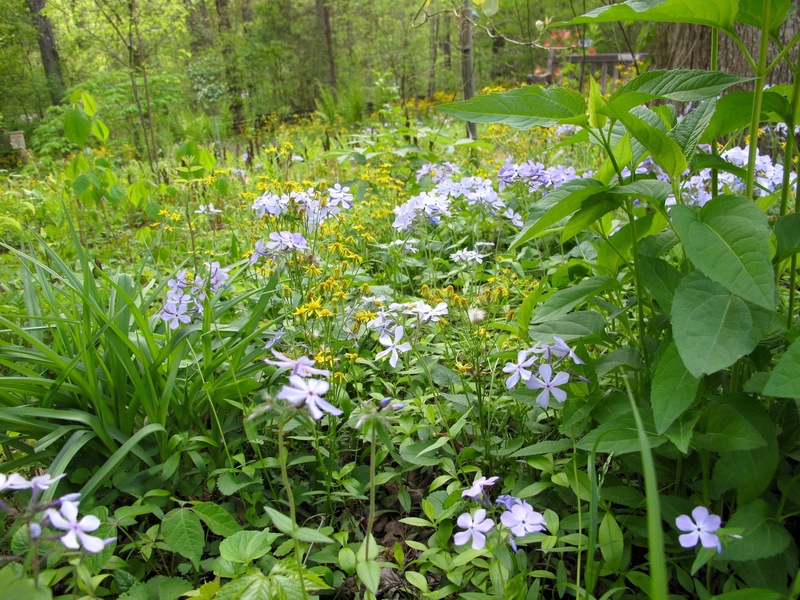 A couple of Eastern Blue Phlox are blooming in my own garden. 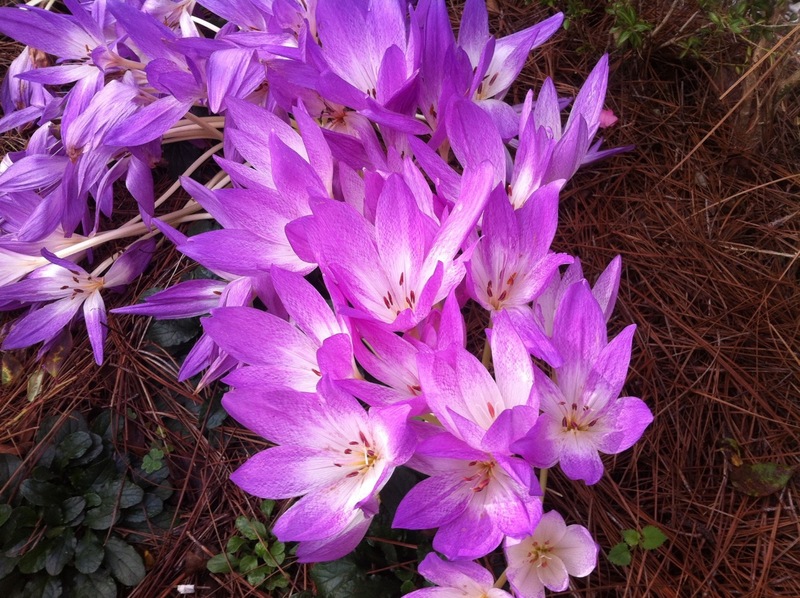 They have been difficult to establish but this year they finally seem settled. 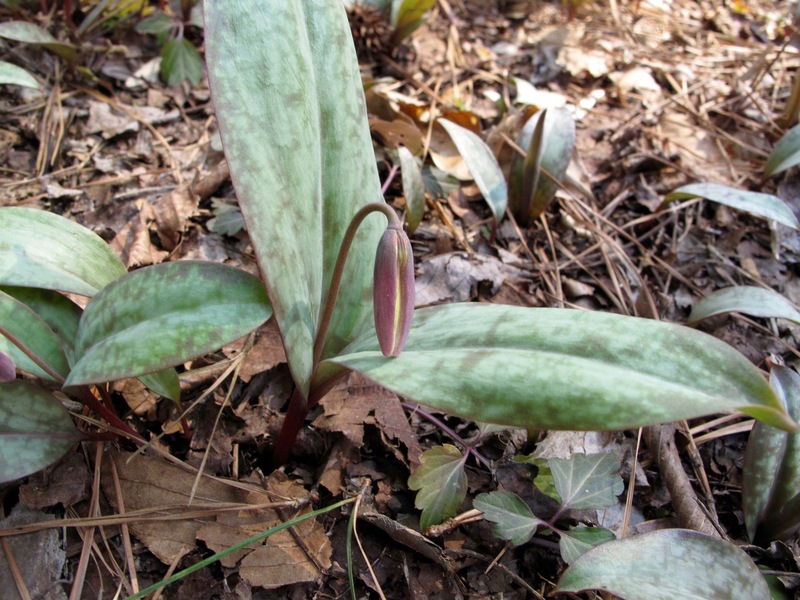 There were still plenty of Trillium and May-Apple, Spreading Jacob’s Ladder was fresh, sweet shrub looked and smelled delicious. At every turn was something new to admire. If you have time to linger, click an image below to start the slideshow. 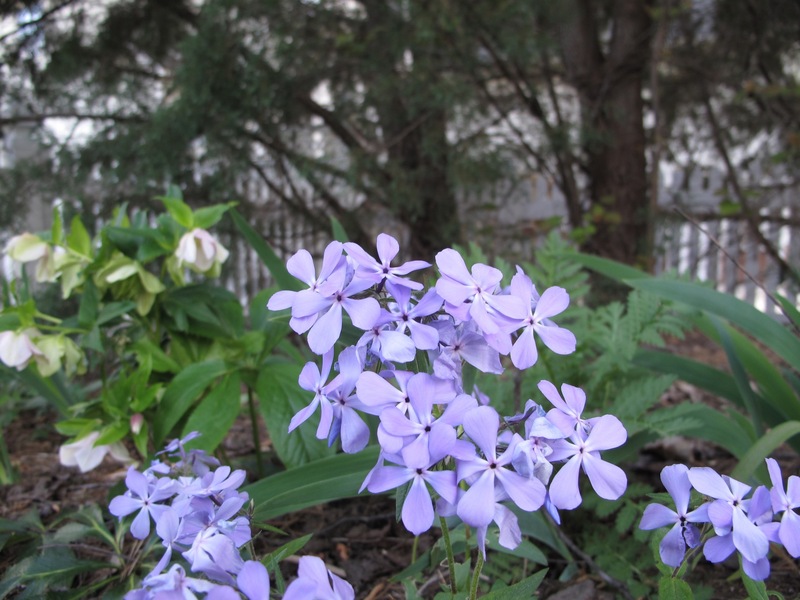 This entry was posted in garden and tagged NCBG, Phlox divaricata, public gardens on April 12, 2016 by pbmgarden. 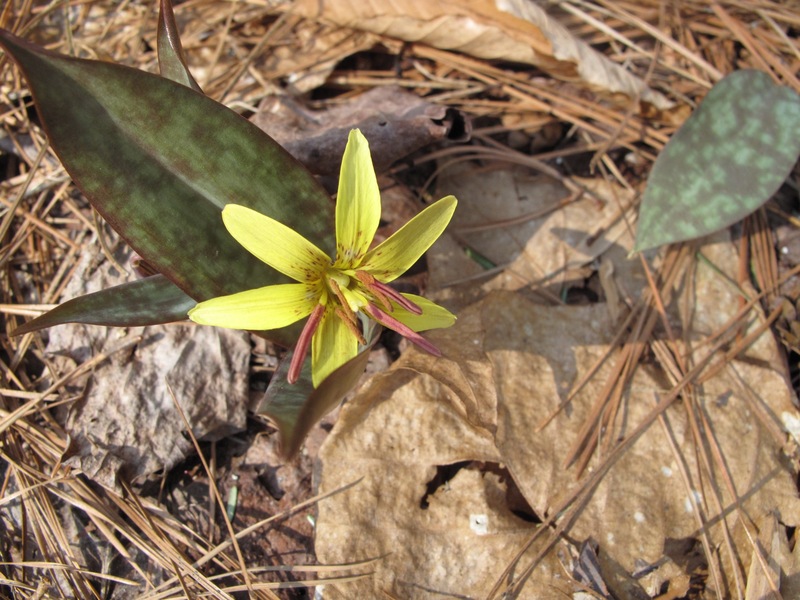 A quick scouting expedition for early spring ephemerals on Saturday, February 27 proved rewarding for my husband and me. 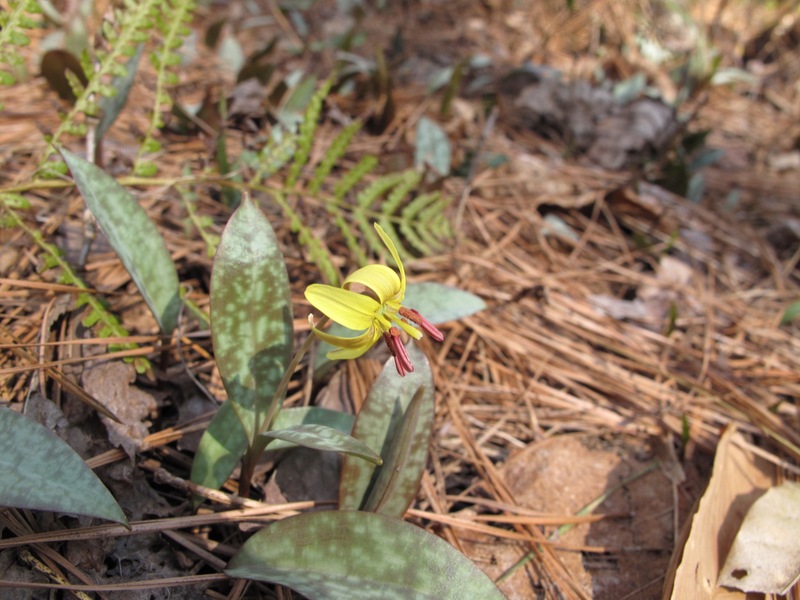 Native to southeastern United States, Erythronium umbilicatum (Dimpled Trout-lily) is coming into flower at the North Carolina Botanical Garden in Chapel Hill. 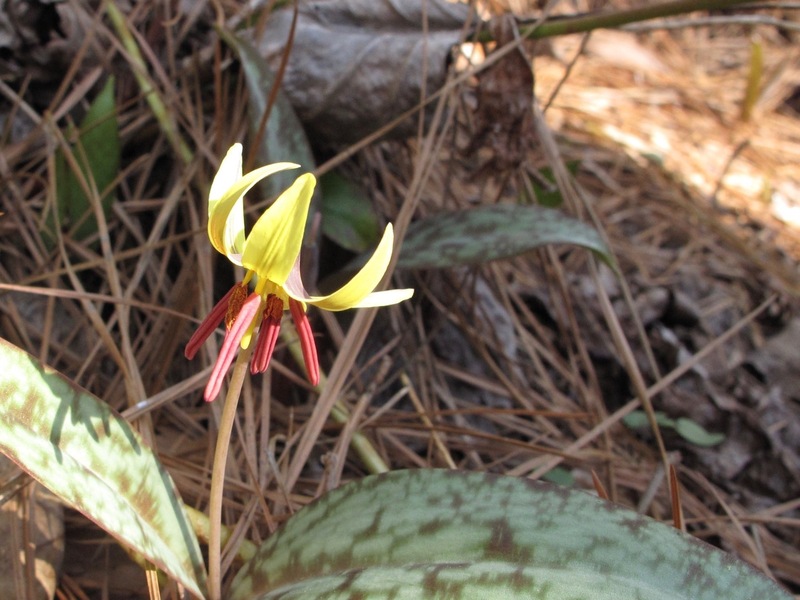 This entry was posted in garden and tagged Erythronium umbilicatum (Dimpled Trout-lily), native plant, NCBG, public gardens, spring ephemeral on February 27, 2016 by pbmgarden. 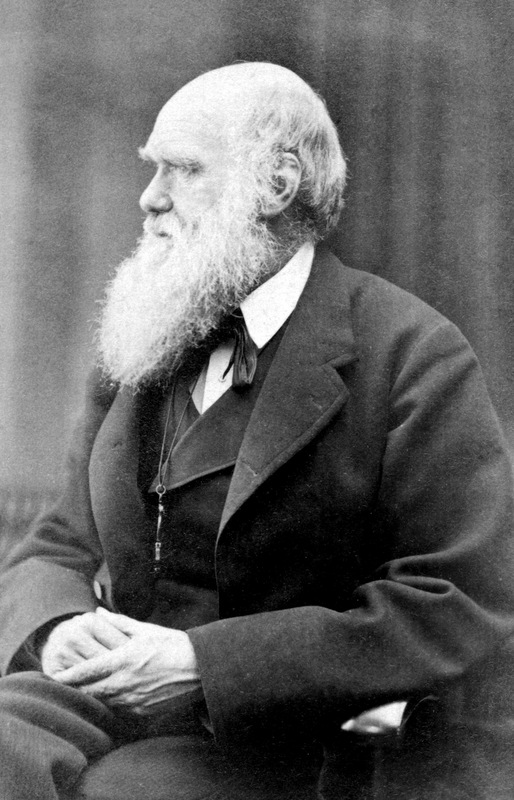 On Friday, to celebrate Darwin Day, my husband and I attended a lunchtime lecture entitled “The Evolution Of Biodiversity: History or Science” at the North Carolina Botanical Garden. There were snow flurries during the talk but by the time we walked to the car only the cold remained. 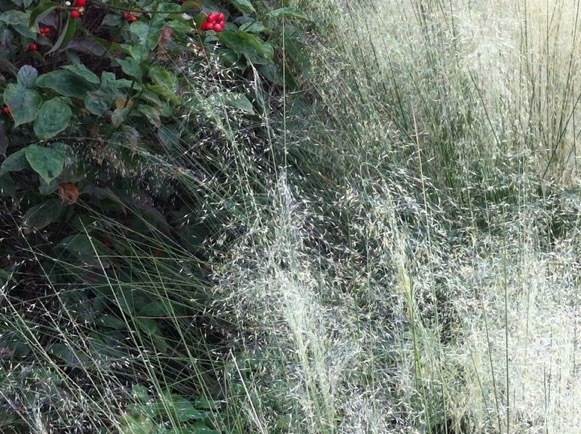 We did not take time to explore the garden that day, but as we hurried back to the parking lot, we admired the light on the grasses fronting the parking spaces. 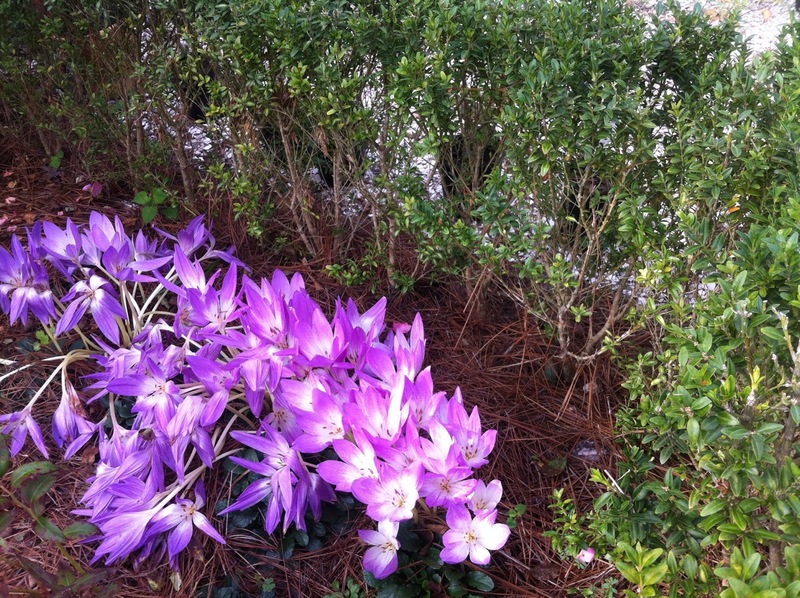 Upon returning home I noticed a camellia on the side of the house was blooming. It has been too cold. How is that possible? Well, the days are lengthening and, before it turned cold this week, it actually had been very warm. 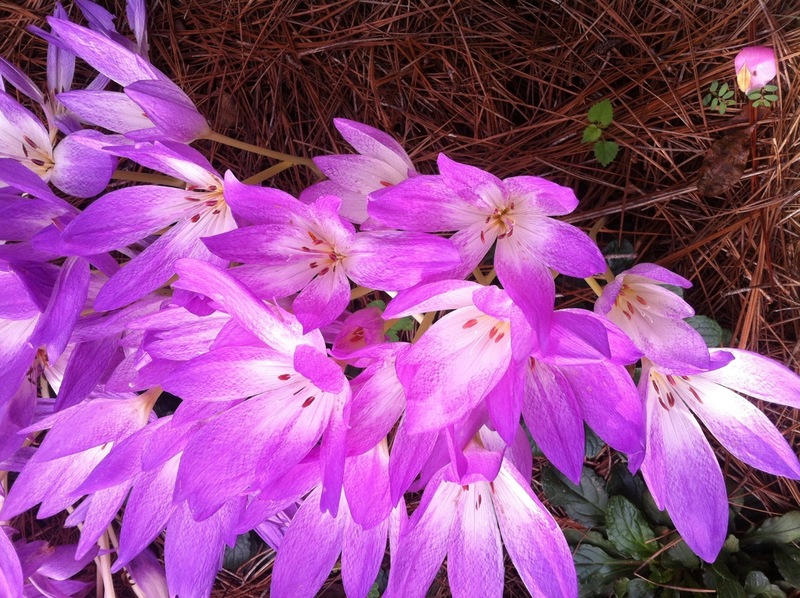 Three flowers were open. 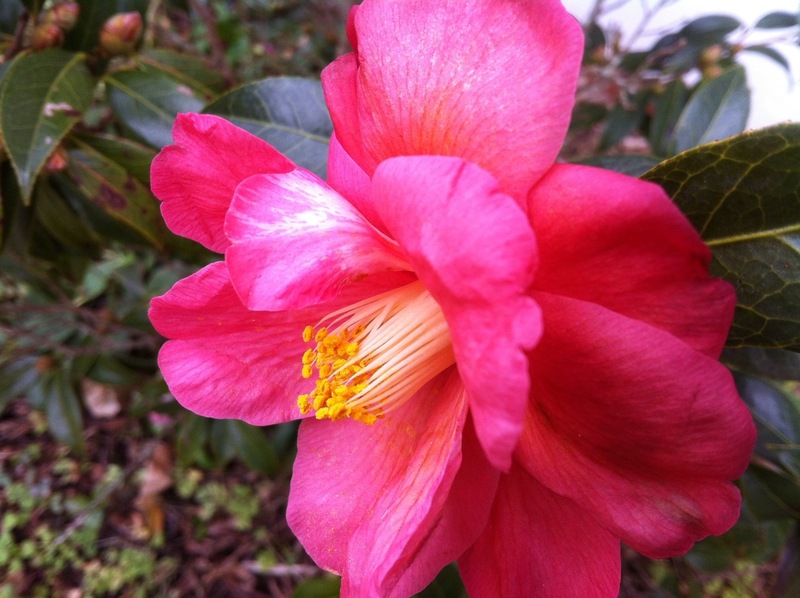 Because of cold weather this camellia failed to bloom at all last winter. Tonight’s low is predicted to be 15°F. Who is feeling lucky? I have been taking this winter one day at a time. Even so, winter is passing by quickly. In a couple of weeks a friend and I will travel to Virginia for the hellebore festival at Pine Knot Farms. Making plans around here in February is usually a sure-fire way to invite an ice storm into town, but definitely this year we are feeling lucky that we will make it. Looking ahead, April is promising to be a great month. 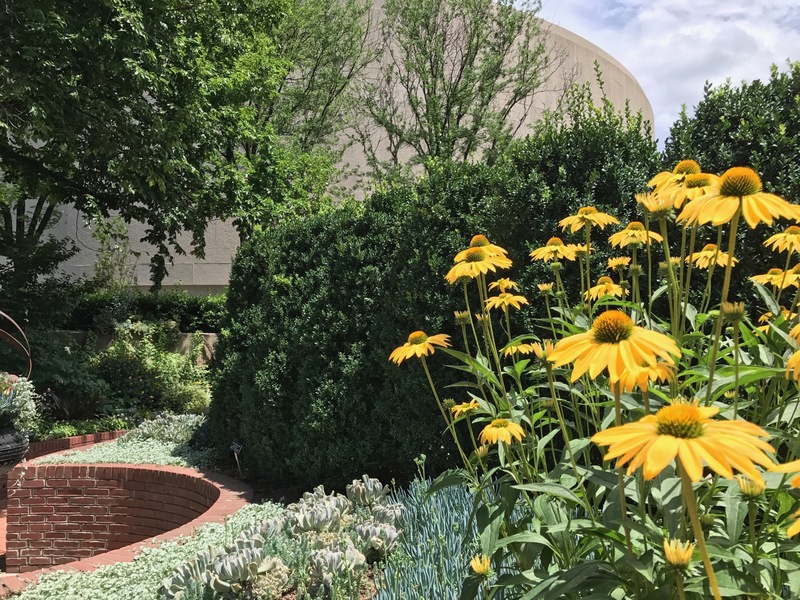 I already have tickets for some Art In Bloom events at the North Carolina Museum of Art early in the month. 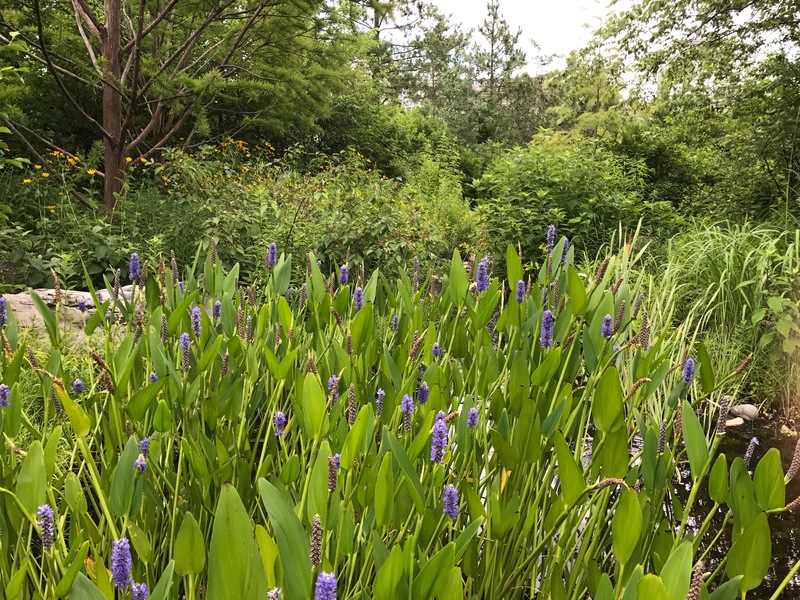 The Chapel Hill Garden Club’s biennial spring garden tour takes place the last weekend in April, featuring seven private gardens. 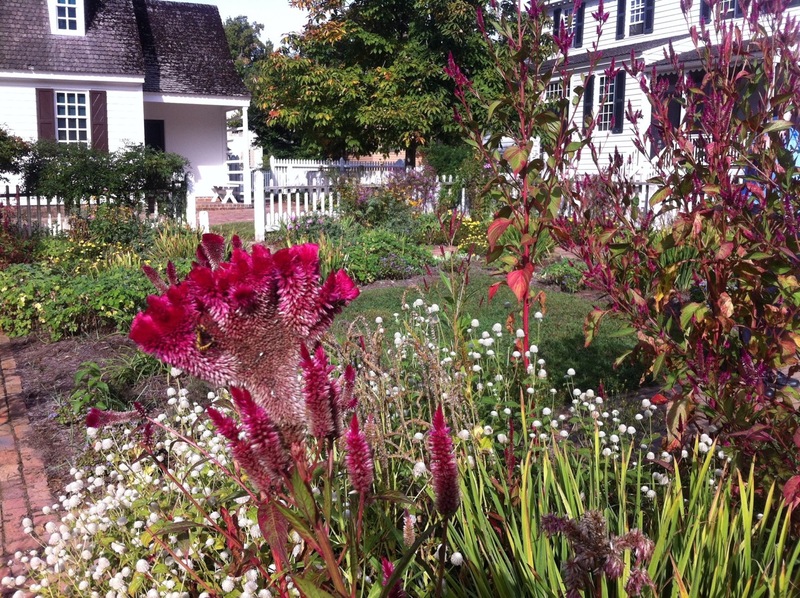 I am already signed up to be a garden guide at one of the gardens for the spring tour. And, not everything special is a garden event. Also in April our daughter is coming to visit from the west coast. March will be busy but I am feeling lucky. This entry was posted in garden and tagged Camellia 'Coral Delight', Darwin Day, NCBG, public gardens on February 13, 2016 by pbmgarden. 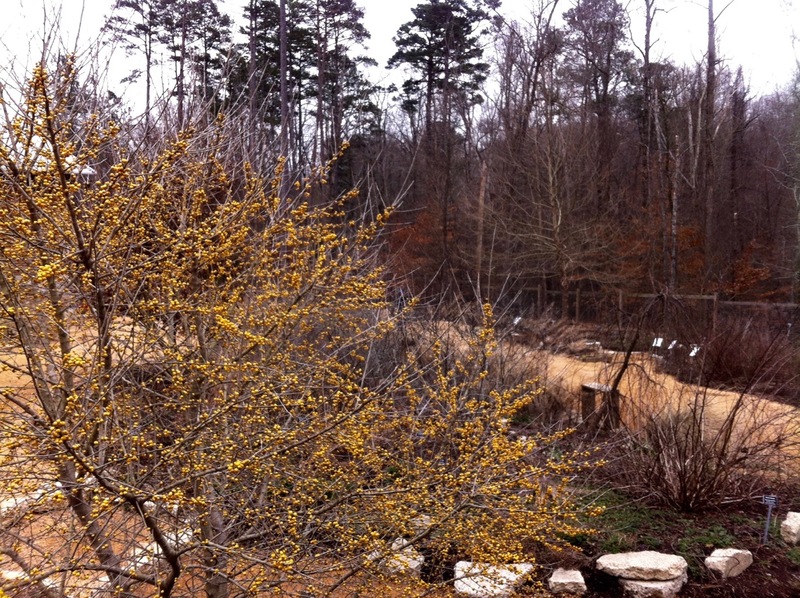 Scenes from North Carolina Botanical Garden in Chapel Hill yesterday. 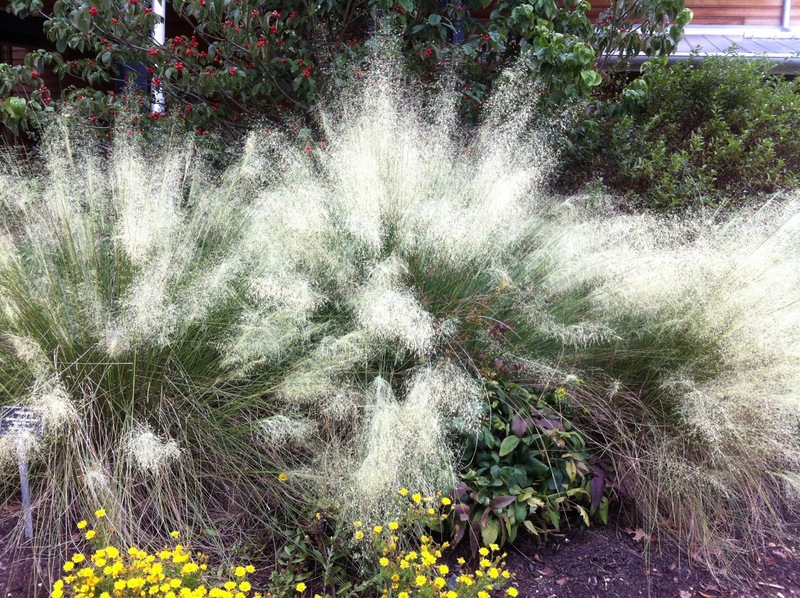 I have always like pink muhly grass but how about this white form? 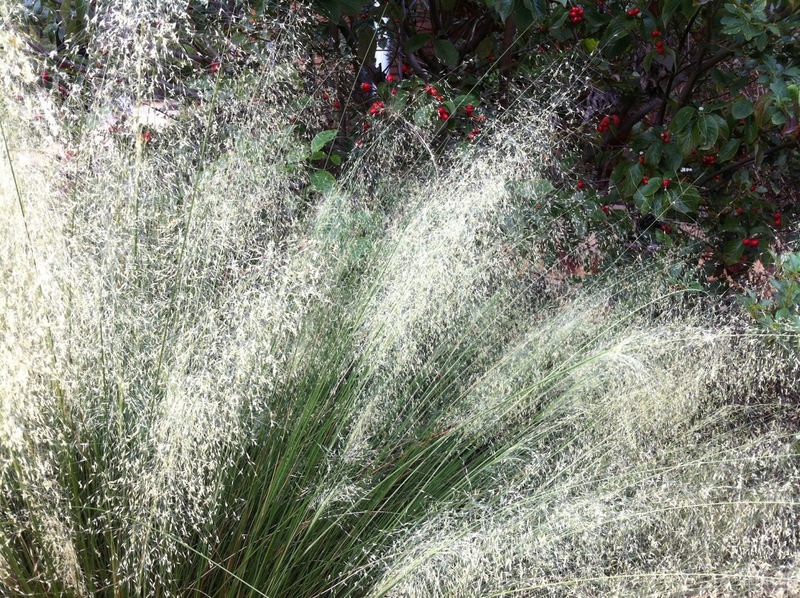 Muhlenbergia capillaris ‘White Cloud’ (Hairgrass). 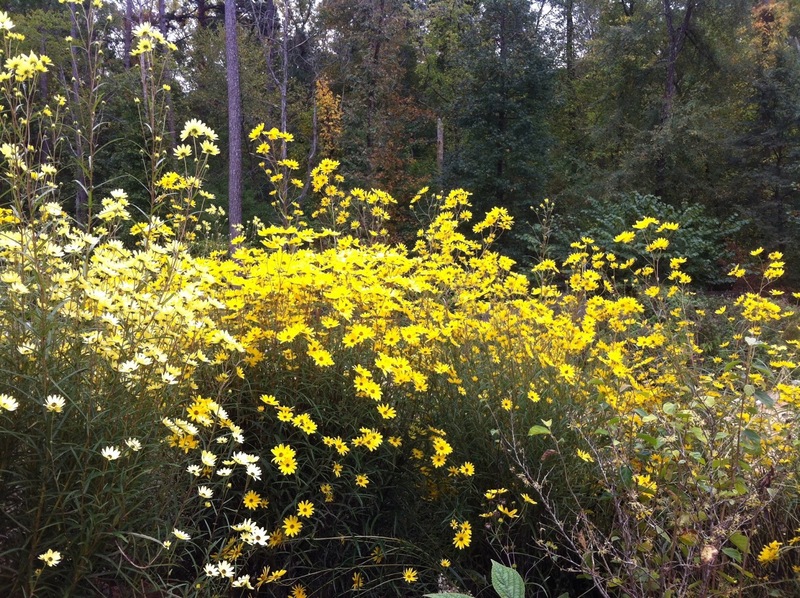 I think the darker yellow in the next photo is Swamp sunflower (Helianthus angustifolius). 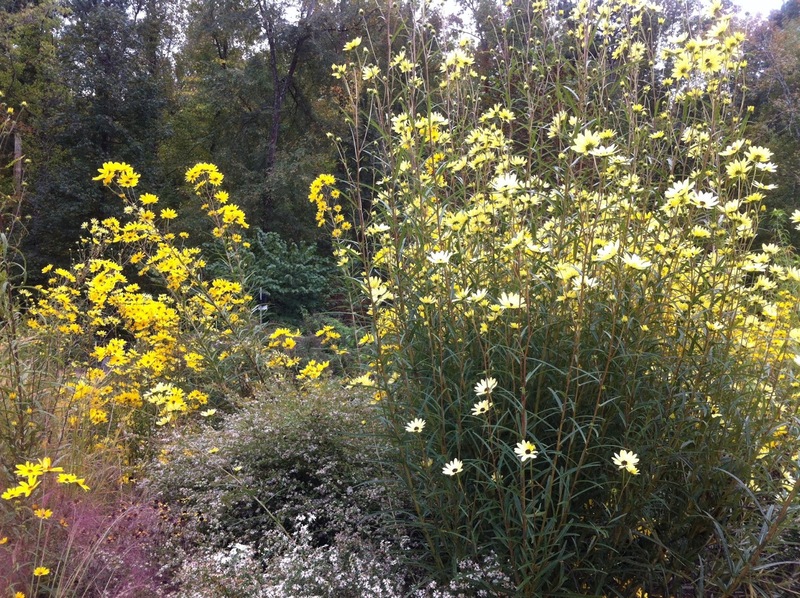 Not sure about the pale yellow flower. 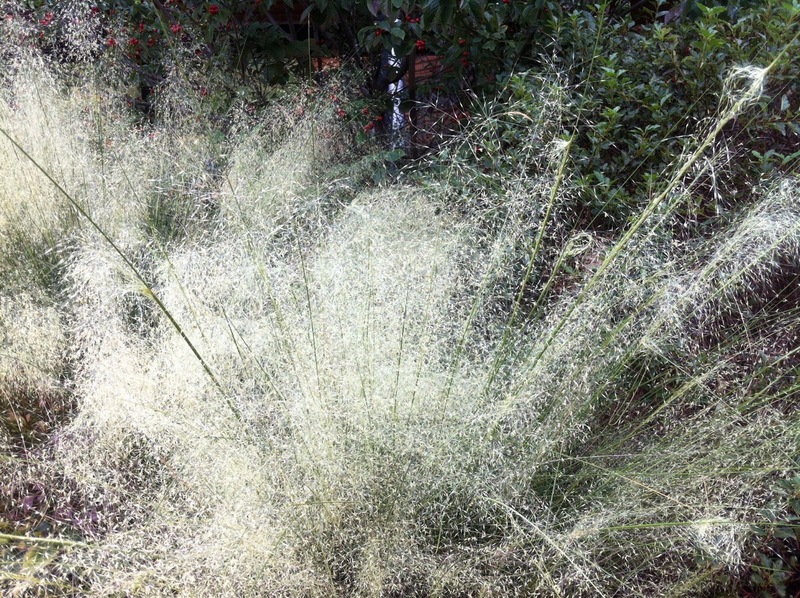 This entry was posted in garden and tagged Helianthus angustifolius (Swamp Sunflower), Muhlenbergia capillaris 'White Cloud', NC Botanical Garden, public gardens, wordless wednesday on October 14, 2015 by pbmgarden.